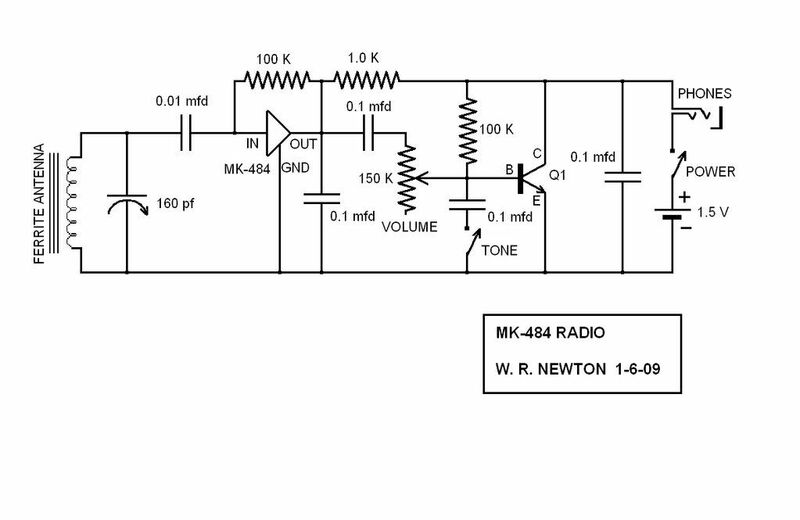 Was reading about TRF sets in the antique radio discussions forum and was inspired to build a TRF am receiver using the MK-484 chip. Thanks to wrnewton i have a good schemartic to start from. I plan on taking the voltage for the amplifier from the rectifier on the power supply and the power supply will be powered by a 12 volt wall wart AC transformer. I will need to figure out some kind of reduction drive for the tuning though. Last edited by Tube Radio on Mar Wed 14, 2012 3:21 am, edited 1 time in total. 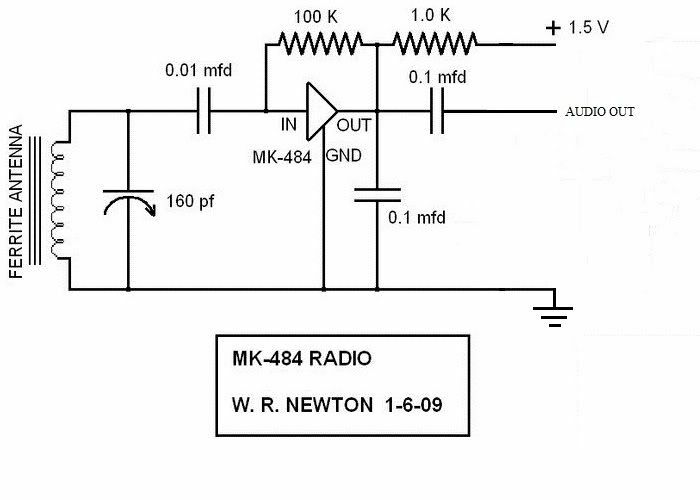 You will find a lot more interest and info on MK484 receivers ( and similar chips like the TA7642 and ZN414) on the Solid State section of Dave Schmarders "Radio Board" site. This part of ARF doesn't deal with solid state homebrew and, in fact, doesn't deal very much with homebrew tube radios, contrary to the title. About 70% of the material deals with home broadcasters for the AM and FM bands. I've noticed that. Seems to be the popular thing at the moment. Believe me, you are doing a vast overkill on the accessories you plan on mating to this IC. Here's a print for a complete radio using the ZN or MK 414, and a 386 audio amp, powered by a nine volt battery. I haven't found the tuning that sharp, BTW, to warrant any type of gear reduction, although I did buy a small Vernier dial for my next TRF set. Might be, but I do want a larger power output than is attainable from an LM-386. If necessary I can mount the amp chip to the metal computer power supply case if there is not enough room for the heatsink. Only problem will be figuring out how to add an external antenna as I am pretty sure the metal case will keep RF from getting to the coil. I do have a question. How much audio output can I expect from the circuit before the audio amp? If necessary I can add a preamp. Had to go with the assembled kit http://store.qkits.com/moreinfo.cfm/FA607 to meet the minimum $15.00 order. Now I just need to get the parts needed to build the RF portion of the receiver plus a speaker. The input sensitivity of the amp is 150mV / 200k. I will need a 200K variable resistor for the volume control. I do have a switching type wall wart power supply that is 12 Vdc 2.5A regulated. Will that type of power supply work for this project or is a linear type of supply best? How much audio power will I get using an 8 ohm speaker if the amp puts out 15 watts at 4 ohms? I would like an 8 ohm speaker if possible as that will allow me to run an extension speaker of the same size. Looks like the only things that will be in the computer power supply case will be the amplifier, tuner, volume control, power switch and speaker. I could then use another similarly sized case for the extension speaker. 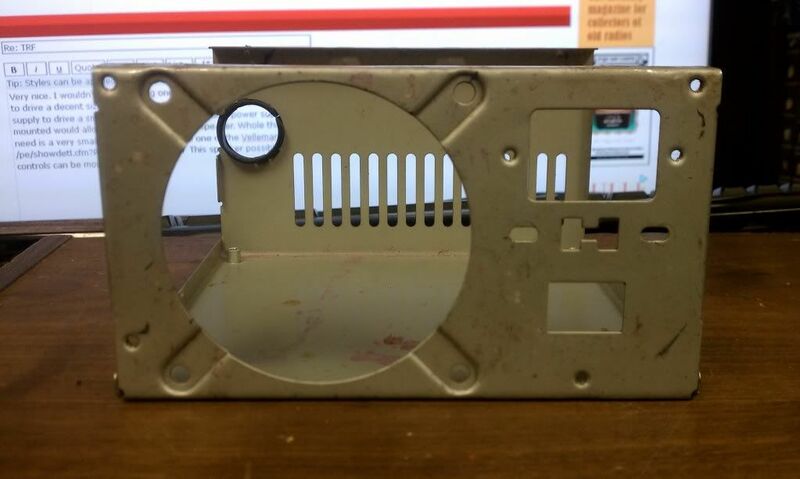 Good thing about it is the case can be painted any color I desire. Last edited by Tube Radio on Feb Sat 04, 2012 7:13 am, edited 1 time in total. The TRF IC supposedly operates best at .9 (point nine) volts, and will burn out if it gets much over 1.5 volts. It's current requirements are nil. The supplies you are suggesting are far and away beyond it's needs. I'm afraid I can't answer your question on which type to use, but just recommend being very careful you don't apply too much juice to the IC. AFA the audio amp, the Rat Shack amp I was using employed a 386 IC, and I only operated it at maybe 1/3 volume for comfortable listening. Full volume was earsplitting. If you are going to position an AM receiver circuit inside a metal case, then locate the Ferrite antenna outside and a bit away from the case, in it's own small enclosure. 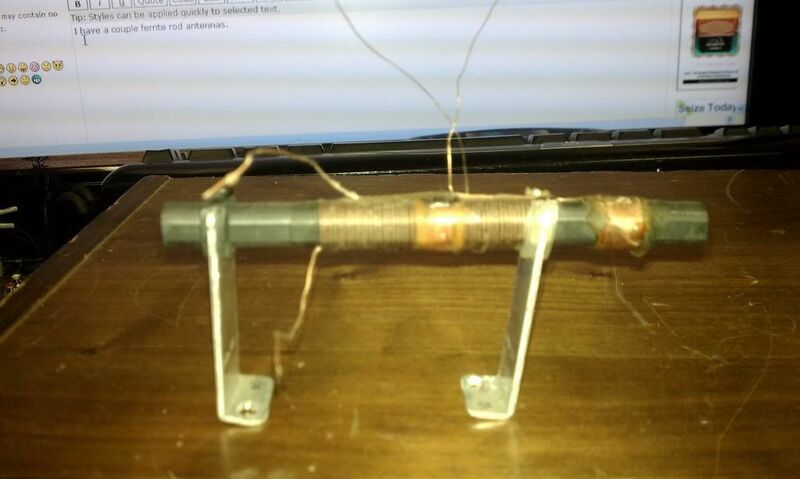 I might have to try that, but if I can rig up an antenna coil like maybe one turn of wire around the ferrite rod with one end grounded and the other going out of the case as the antenna will that work ok? You'll have to experiment. Keep in mind that the circuits this IC works with all use small Ferrite antennas, and not whip antenna rods or ground connections. I have a couple ferrite rod antennas. Has two coils one of which was used to allow for connection of an external AM antenna. Will either of the two work? The single coil ferrite rod I can mount on the back of the chassis on the outside if necessary. Either one should work just fine. Of course try both to see if one gives superior performance, and try using an external wire or whip antenna with the second one. Will do. I suspect that I can use an RF generator modulated with an audio signal in order to see what tuning range the circuit has to be sure I have the proper coil and capacitor values. I don't have any of the small tuning capacitors. Will an open frame tuning cap of the type found in some of the smaller table top transistor radios of the 60's work? If so I may have the tuning capacitor out of one or two of them and if not I can probably find a radio at my local flea market to rob the tuning cap from. I am sure the tuner from any AM radio would work, given that they all would tune the same frequency range, regardless if they are metal open frame or sealed plastic. If you take one out of an existing radio which also has a Ferrite antenna, take that as well, as they are designed to match each other. 1. This is not going to be like an AM table radio... not even as good as an AA5 tube radio. The IC circuit is a simple detector with lots of amplification. 2. You can use an external antenna and ground. My radio was much improved that way. 3. DC Voltage on the output pin needs to be under 2 Volts. I ran mine up to 1.8 and got a lot of audio distortion. 4. An LM386 produces enough audio for a small speaker or headphones. If you want to drive a larger amplifer, you may want to put a single stage of audio amplification between the MK484 and the external amp. Or just use an LM386 to drive the external amp. You don't want to load down the output of the MK484, so an additional stage may be desirable to ensure that the 484 is driving a high impedance load. 5. I built my first receiver and had to put it in a metal box to keep the local AM station from blasting through all over the band. I discovered that short connections on a printed circuit board was the best way to go. Before investing in speakers, etc. I would get the basic circuit built and see if it does what you want. It was originally designed to work without an audio amp, just driving a small headset and not using any antenna other than the ferrite rod. This concept works in Hong Kong or New York City, but not so well out here in the "sticks." Will 200K be a high enough impedance for the circuit to work properly? If so then I am all set. If not I will build the first circuit with the transistor to provide some gain. Concerning the ferrite rod if it has more than one coil I would use the coil connected to the tuning cap and use the other coil for an antenna, right? Not sure how I will mount the tuning cap so that I can use a dial pointer or maybe I will just mount the cap so that with a couple pulleys I can have the tuning control on the front panel and not use a dial pointer. Will prob be using this mostly with my two tube broadcaster since there are not many good AM stations in my area. If your ferrite rod has two windings, use the one with the most turns for the tuning circuit. The smaller number of turns can be connected to antenna and ground. For local stations, the rod alone may be enough antenna. Note when mounting the tuning capacitor, it cannot be connected to DC ground. 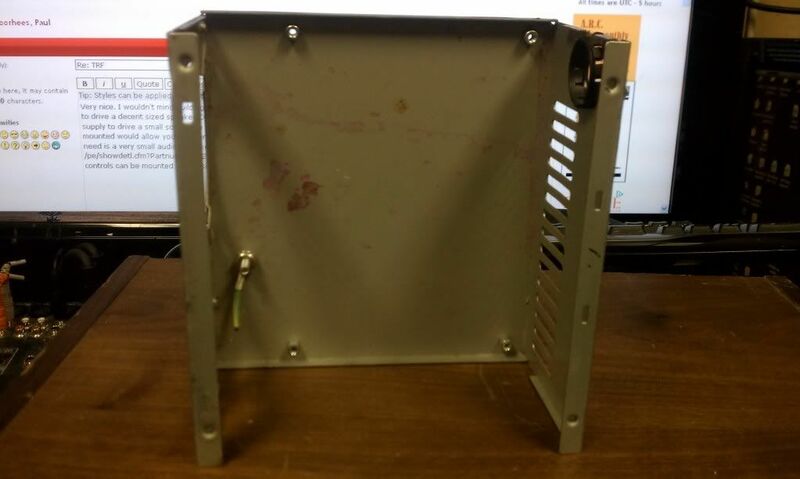 If you are using a metal cabinet be careful that the power supply (-) is not connected to the cabinet. These little one-chip radios were designed for inexpensive plastic cases. I built mine on a wooden board. I have the necessary plastic tuning cap and ferrite rod antenna from a cheap older radio I bought today so that should work. I do have to rethink my choice of cabinet though. I will need a larger cabinet for what I want to do. The toroid acts as an antenna for the AM band. Last edited by Mike Toon on Feb Sun 05, 2012 7:05 pm, edited 4 times in total. Is that antenna trimmer a screw-driver adjustment? I didn't see a knob. Seems like you used a toroid, not a rod, so the radio works only with an external wire antenna? 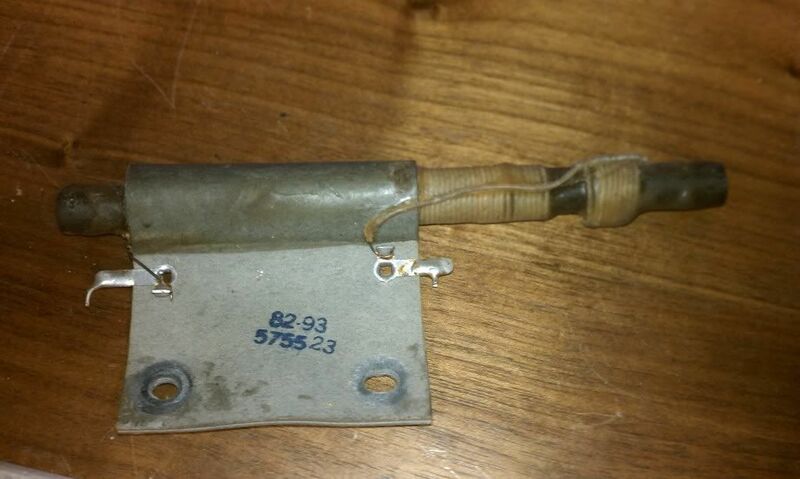 I had some old rod antennas left from junked radios, so I can get local stations, even KCBS (50 miles) without a wire. The radio which donated the tuning cap and ferrite rod antenna also donated the necessary geared down tuning as the dial cord assembly with tuning shaft and pulley are on a separate plastic piece that was attached with screws. All I need to do is mount the tuning cap to the plastic piece and I am all set. I agree, excellent work! Interesting using a Toroid ferrite with a winding for the antenna, which might be sufficient by itself. Rich, I can get KCBS at night with my little TRF unit using just it's Ferrite antenna, over 400 miles away.